We love Margo Rieman. We know she wrote a food column for Cosmopolitan Magazine. We feature her cookbook, Twelve Company Dinners and since then, we have received numerous e-mails asking about Margo Rieman. I do hope that one day someone, ANYONE, who knew her will drop us a line about her. She looks like she would be more fun to sit in a kitchen with and talk about food, or anything else for that matter. Her book Quick Gourmet Dinners is a very gook book for anyone, but is especially handy for a beginner. At first glance, this might seem like a light weight vanity piece, but the recipes are solid and quite good. And above everything else, Rieman is funny and helpful. She recounts the time a friend found no lemon juice to make a vinaigrette, so he used gin. Rieman not only perfected the recipe but offers up the suggestion to try it dry vermouth. Mix all the ingredients thoroughly and let sit, stirring occasionally, until serving time. Then, pour over greens and toss. note: a little more gin can be added, but not so much that you identify its flavor as such. Who doesn't love a good gin salad, however Rieman and I differ. I think a "ginny" taste would be fine! Here is what she tells us about using this book. 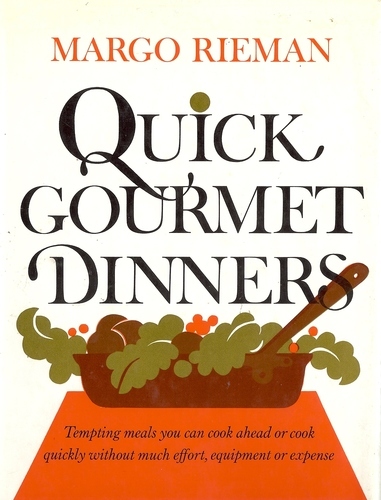 "...my kind of cooking does not require hours of precious time (which I seldom have), a Cordon Bleu background (which I lack), or an enormous collection of kitchen equipment... Basically, I cook with a couple of saucepans, a couple of frying pans, and a big pot..."
One really can't go wrong with any of Rieman's books. Again, if you by chance knew her...let us know.